I love these for cleaning our bathrooms. Just pop it open and pull one out. Easy to grab one and touch up the bathroom for a quick cleaning & sanitizing. As good as other name brand wipes! I am reviewing this product based on the sample of two Kirkland Household Extra large surface wipes I received on my last visit to Costco. It's size is 8 inches by 10 inches that is far bigger than the usual wipes. I used one wipe to clean off my kitchen floor and the other to clean the bathtub. The wipe claims to kill 99.9% of bacterias in 15 seconds and I kind of want to believe it, since it is a Kirkland product. The wipe is easy to use, does not leave a film behind, rather leaves a very neat smell that gives you a sense of cleanliness. 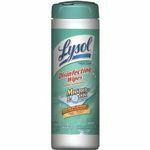 I saw the product in the store and it is very well priced for a big box as compared to other name brand disinfecting wipes, including the one I am currently using. I might grab a pack when it goes on sale next time and I am out of the ones I am using currently. Honestly, I did not find any difference in the way they work from other wipes I have used in the past, only price is the factor that would force me into this purchase. So, if you have a big house and you need to use wipes daily then I will recommend purchasing these Kirkland household wipes! I enjoy Kirkland Household Surface Wipes over the name brand for a few reasons: Kirkland is cheaper, larger, and doesn't leave a sticky film behind. I love these wipes, and use them all over my house. Performance These wipes are great. I use them to clean doorknobs and light switches, we wipe down kitchen counters and bathroom toilets with them, I've used them to scrub up accidents on the rug, and I've even used them to scrub my kitchen floor. 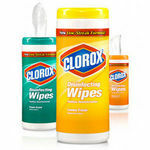 If you have a dirty surface, these wipes are tough enough to scrub most any kind of mess there is. They are very convenient, and easy to use. Every now and then I'll have a wipe get stuck and I'll have to yank it out of the package, but its cleaning power makes up for that annoyance. I just would not use them on mirrors or windows; they tend to leave a streaky film on them. For all other household areas, its great though; a streak-less clean every time. Scent The packs I get have different smells, the kitchen scrubber (which is my favorite) has an orange smell that actually smells citrusy. The lemon smell is good too. The other green package is just a generic kitchen cleaner and it gives me a headache after cleaning with it for a few hours. But the orange one isn't bad at all. Kirkland Household Surface Wipes are by far my favorite wipes for cleaning and disinfecting. 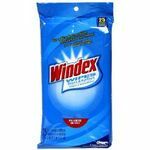 I love these wipes for cleaning our home and use them in every room. They are easy to use and leave a light, clean scent. I am left feeling confident that they've done a good job after using them to clean. I use them on all types of surfaces including cabinets and counters among many others. I actually like the quality of these cleaning wipes better than the Lysol wipes. They use to come in cans like they Lysol or Clorox versions but now come in a soft pack that are easier to store and carry around when cleaning. You buy them in a three pack that includes three different scents and one of the packs has a side for scrubbing. This is good for those tough to clean areas. The only con I would say about these wipes is if you are using them for to long and have sensitive skin they will completely dry out your hands and fingers. So if you are planning on doing a huge house cleaning job you might want to wear gloves when using these. Even with this con these are by far my favorite cleaning wipe. I always have them on hand and in my house. I would highly recommend them to anyone. Easy to use, effective, and leave a light fresh scent behind. 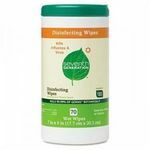 I love these wipes for cleaning our home. They are easy to use and leave a light, clean scent. I am left feeling confident that they've done a good job too. 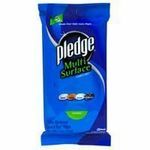 I use them on all types of surfaces and have never had any issues. Kirkland surface wipes work just as well as the name brand. 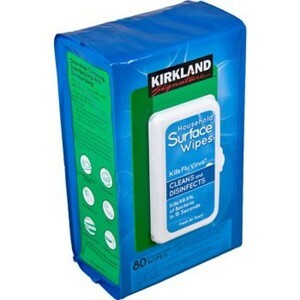 Kirkland surface wipes are a great value. They work just as well as the Clorox and Lysol wipes but they cost less. The wipes are generously sized and come in a easy to reseal package that is similar to their baby wipe packaging. I actually prefer this packaging over the tub type that Lysol and Clorox sell. It minimizes the difficulty in getting the last few wipes out of the package. The package has three 80 packs of 20.4 x 24.8 inch wipes. Each three pack includes lemon scent and fresh air scent. I like the fresh air scent but my husband prefers the lemon scent. We use them occasionally to clean off the keyboard and mouse for our computer. The disinfectant properties help us to stay healthy. My husband also uses them to clean his massage table in between clients. Having wipes is much more convenient then a spray and paper towels. When we have unexpected company I send the kids around with these wipes and they make quick work of the messy surfaces around the house. I try to minimize my use of disposable products but I love having these wipes around for occasional use. We use the Kirkland Household Cleaning Wipes in every room of our house. They all work very well at cleaning up everyday messes, but the scrubbing wipes are the best at cleaning up tough stains and spills. I use the wipes on everything from kitchen counters and cabinets to everything in the bathroom. The Kirkland wipes clean up messes very quickly and efficiently, for less money than name brand kinds. I strongly recommend them for families with little time for cleaning.